Ask us about products we carry that have a combination of permanent built in stain protection with superior durability and surprising softness. Did we mention it has a lifetime stain warranty? Problems with common household odors? Trouble with allergies? Ask us about a product that will instantly improve your environment. Silver Release uses silver and zinc ions to prevent the growth of odor and stain causing bacteria, mold and mildew for the life of your carpet. In addition to Silver Release is Magic Fresh, a built in treatment that continually reduces common household odors for the life of your carpet! It's safe on pets, soft and at an incredible value to you. The more you're willing to share when asked questions like these below, the better your flooring selection will be. What are the room's lighting sources? What's the style of the room? Traditional? Contemporary? Rustic? What's the feel of the room? Casual? Formal? Somewhere in between? Will people have food in this room? Will kids play in this room? Will kids play with their food in this room? You get the idea. Your sales associate will want to know all the things to help you make the best choice. You probably shop for flooring so rarely; you shouldn't be expected to have the answers. But it's great to have the questions. Are there guarantees or warranties on the flooring? On the padding? On the installation? What features does this flooring have that makes it easy to maintain? Can I take a sample home to check how the flooring color will look in the room? What kind of padding or underlayment does this flooring require? If I buy an additional amount, could I minimize the number of seams in my room? To have fewer seams, is this carpet available in a 15-foot length? Who is responsible for removing and disposing of old carpet and padding? Is there an additional fee for that? When you go to the store, feel free to bring fabric samples, pillows, paint swatches, carpet cushions, or bedspreads. Don't be embarrassed to bring whatever you need to help you make the choice. Your flooring installation shouldn't be scheduled until all your painting, wallpapering, or construction is complete. Your flooring should be the last element of your remodeling project. Check the sample in your home, and be sure to check it during the day and at night. The lighting in the store could give you a completely different look than you'll find at home. Also, look at the sample on the floor, not just at eye level. At the time of your purchase, a qualified "estimator" will come to your home to measure exactly how much flooring you will need. After that, make sure your cost estimates include everything, including padding, moving furniture and installation. If you are interested in where the carpet seams will be, feel free to discuss it with the sales associate before purchase. Make sure you get what you ordered. Save your flooring sample. When the installer arrives, match the sample to the new floor. Verify the color, style, and texture. If it's not what you ordered, it's easier for everyone if you catch it immediately. Ventilate the room well during installation — open doors & windows. Make sure to request warranty information and read immediately after installing carpet so you are well educated on the proper care of your carpet. Wool: Wool carpet is naturally stain and soil resistant. The wool fiber's structure consists of overlapping scales, arranged much like roof shingles. These scales inhibit dirt from adhering to the fiber and help fleck it away. Wool has significantly better soil release than any other fiber. Wool cleans better, making stain protection unnecessary. 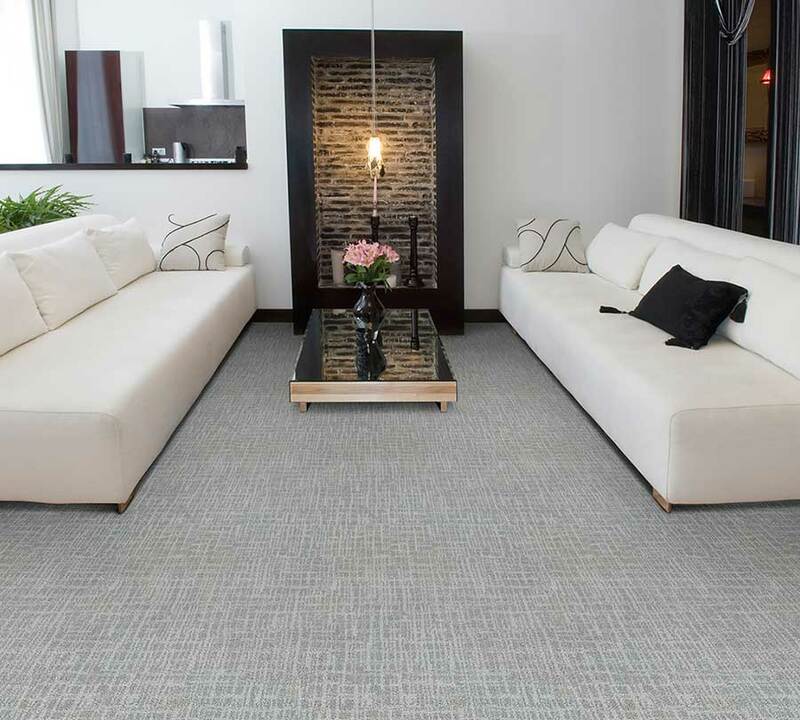 Wool carpet is naturally crush-resistant. The wool fiber is naturally curly, and it has more crush resistance than any other fiber. Wool carpet is hypo-allergenic. Nylon: In overall performance characteristics, nylon is the most versatile of all fibers, providing excellent flexibility in creating a variety of carpet styles. It is durable, resilient, and receptive to dyeing for color versatility and uniformity; many new nylon yarn systems are also exceptionally soft. Though not inherently stain resistant, most nylon carpets are treated with stain-resist carpet treatment for protection against household spills and stains. Olefin/Polypropylene: Unlike the other fiber types, polypropylene will not absorb water and must therefore be solution dyed (pigmented) to impart color. Solution dyeing is a pigmentation process in which color is actually built into the fiber when it is formed, or extruded, thereby becoming an inherent part that cannot be removed from the fiber. The color will not fade, even when exposed to intense sunlight, bleaches, atmospheric contaminants, or other harsh chemicals or elements. However, since it is not as resilient as other fibers, polypropylene is normally used in loop pile constructions in which there is less need for superior resiliency. PET: Fibers retain their color and resist fading due to sun or harsh cleaning. Shades can be richer and brighter than those found in nylon yarns. Because plastic beverage containers are made with top quality PET resins as required by the U.S. Food and Drug Administration, recycled PET is superior to lower grades of virgin synthetic fibers used in making other brands of polyester carpet yarns. PET has exceptional strength and durability and the value of these properties is not lost in their recycling process. SmartStrand: SmartStrand fibers provide permanent stain protection that is literally built-in to the fiber so it can never wear or clean off. Usually tough stains such as red wine, mustard, coffee, and bleach have vanished with nothing more than hot water and a little detergent. Its stain resistance is so good that, for the first time, Mohawk is offering a Limited Lifetime Stain Warranty for SmartStrand products. SmartStrand with DuPont Sorona fibers are made of 3GT molecules, a molecule structure that provides permanently engineered-in stain resistance. So we don't have to apply topical stain-resistance treatments like nylon or PET polyester carpets do. No chemicals means there are no stiff strands or harsh-feeling fibers leaving it very soft to the touch. Depending on the type of carpet you have, you'll want to use a vacuum with a rotating brush, a beater bar or SUCTION only. If you have shag or wool carpet, use a suction-only vacuum cleaner with no beater bar. If your carpet snags DO NOT pull on the fiber or you may damage the carpet. Contact a carpet professional and they will walk you through the appropriate repair steps. Bleaches, hair dyes, iodine, insecticides, mustard with turmeric and plant fertilizers: For these types of stains, call a professional. In order to maintain and protect your warranty coverage under the terms of these warranties, you must do the following: A minimum of one professional cleaning every 18 months is required. If the carpet becomes soiled always consult the maintenance guidelines from the carpet manufacturer. If using topical cleaning solutions read directions carefully and NEVER rub the carpet — blot with a white towel till stain is removed. Call us today at 310-479-3761 or fill out our convenient Contact Form to request your free consultation. Barry Carpet — Proudly serving the Los Angeles area since 1965.